I’ve just come back from Wales, near Abergavenny, the birth place of strong woman Vulcana. Her real name was Kate Wiiliams and she claimed to have been born in 1883, although this is disputed. She ran away with William Roberts who ran a local gym and who was already married with a child. Kate sometimes used the name Roberts. 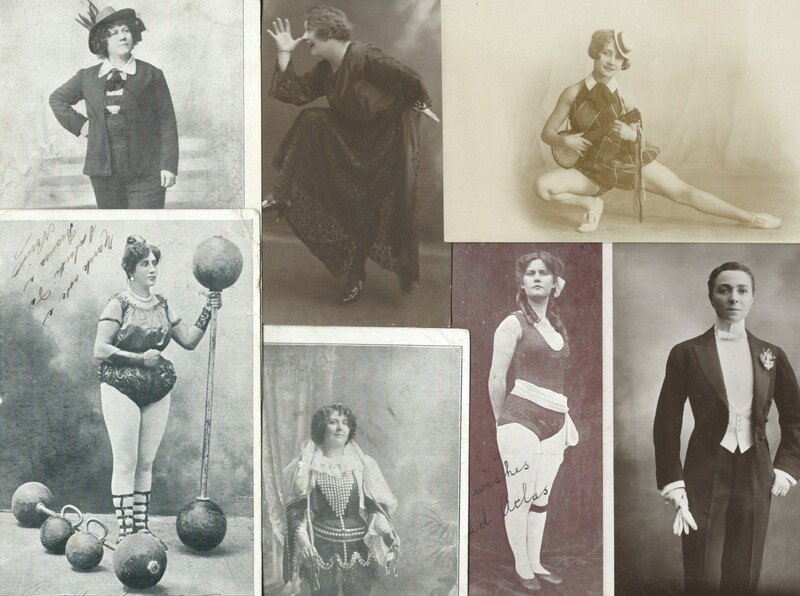 They toured Britain, Europe and Australia with an act based on shows of strength and featuring the Atlas and Vulcana Group of Society Athletes. Atlas (William Roberts) was found to exaggerate the weights he could lift but Vulcana was much admired for her strength and often performed without Atlas. Her greatest rival was Athelda and on 29th May 1913 at Haggar’s Theatre in Llanelli a contest resulted in a victory for Vulcana. She was able to lift a challenge bell that Athelda tried unsuccessfully for twenty-five minutes to lift. Vulcana won many commendations, awards and medals and used her strength off stage as well as on. She stopped a runaway horse in Bristol and also saved a child from drowning. In 1901 a wagon was stuck in the mud in Maiden Lane in London and she lifted the back so that the wheel could be freed, much to the surprise of the crowd, while in1902 it was reported that she knocked out a pickpocket who was trying to steal her purse. She risked her life in 1921 when the Garrick Theatre in Edinburgh caught fire on an evening when her troupe were due to perform. She saved another act’s horses but her hair caught fire and she received severe burns to her head. In 1910 Vulcana claimed to be the first person to report to the police the disappearance of a music hall performer called Belle Ellmore. This was the wife of Dr Crippen who was later charged with her murder. Vulcana and Atlas stayed together and had six children although they often claimed to be brother and sister. Some of the children worked with them in the troupe. I have a card of Maud Atlas who performed with the troupe and is billed as one of the ‘sisters’ Gwen and Maud. The modern day Vulcana Women’s Circus established in Brisbane, Australia is named after the wonderful Vulcana, strong woman. This entry was posted in Strong women and tagged Athelda, Maud Atlas, Vulcana on March 12, 2015 by Monomania.